Lithium ion batteries (LIBs) are widely used as power sources for smartphones and laptop computers. They are also essential for certain types of transport such as electric vehicles (EVs) as well as for emergency power supplies in the event of a disaster. Unsurprisingly then, there is fierce global competition to develop LIBs with even higher energy density and better performance. However, there is a major drawback with the current generation of LIBs, in that a flammable organic electrolytic solution is used for the electrolyte, creating is a risk of leakage and ignition. Due to this, the drive to develop safer materials has become an urgent matter. 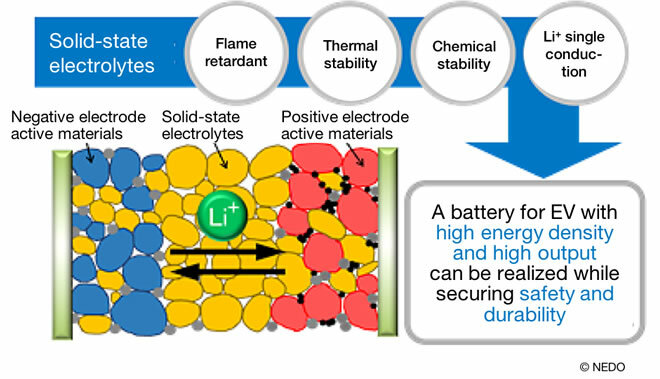 It is in this context that the next-generation LIBs are being developed as all-solid-state batteries using flame-retardant solid-state electrolytes and boasting excellent stability. As a part of this drive, Professor Atsunori Matsuda has proposed a "liquid-phase shaking method" synthesis process. Since this method allows for solid-state electrolytes to be easily produced in large quantities, it has been widely recognized as a major contribution to the development and mass production of all-solid-state LIBs. Currently, the rapid uptake of EVs is driving the urgent need for practical all-solid-state LIBs that realize both high energy density and safety. Toyota stated that it will replace all its models with hybrid cars or EVs by the end of 2025, and it is expected that the shift to EVs will advance rapidly all over the world in the future. In light of these circumstances, in June 2018, the New Energy and Industrial Technology Development Organization (NEDO) launched a research and development project on the early realization of all-solid-state LIBs. In addition to solving issues for the commercialization of all-solid-state LIBs, topics such as development of mass-production processes and evaluation of suitability for onboard batteries, etc. will be tackled. The project is being carried out by 23 major companies in Japan such as automobile, battery, and material manufacturers, 15 universities and public research institutes including Toyohashi University of Technology (TUT), and will be based at the Consortium for Lithium Ion Battery Technology and Evaluation Center (LIBTEC). It is an "All Japan" initiative that will strengthen links between industries. Professor Matsuda of TUT, who is involved in the development of solid-state electrolytes - the key material for batteries - explains the advantages of all-solid-state LIBs. "It is not easy to move ions with large mass in solids. However, if the electrolyte that is sandwiched between the positive and negative electrodes can be made into a solid, the thermal and chemical stability increases, and safety is dramatically improved since the battery becomes more difficult to burn. Moreover, sulfide-type solid-state electrolytes, which use lithium sulfide (Li2S) as the main component, demonstrate high conductivity comparable to that of an organic electrolyte and are capable of a lithium ion transference ratio of 100%. In other words, because we can carry only the ions that we want, we can make a big contribution to improving the energy density." This NEDO project is the successor to the ALCA-Specially Promoted Research for Innovative Next Generation Batteries (ALCA-SPRING) project, which was implemented by the Japan Science and Technology Agency (JST) under the Ministry of Education, Culture, Sports, Science and Technology, and ran from 2013 to 2017. Under ALCA-SPRING, all activities were focused on the goal of developing next generation batteries. These ranged from battery design and material development for positive and negative electrodes and electrolytes, to evaluation and analysis. The new project has been transferred to NEDO under the auspices of the Ministry of Economy, Trade and Industry. This exceptional initiative is being framed as a second phase project on all-solid-state LIBs, with the goal of putting the research to practical use. While Toyota was the only company that participated in the first phase, several major Japanese manufacturers have come together for the second phase, demonstrating the enthusiasm for betting on this research as an "All Japan" national effort. "Japanese manufacturers used to hold more than 90% of the global LIB market share, but this figure has currently dropped to one third. The collective will to avoid the same thing happening with all-solid-state LIBs explains the strong backing for the research. That's why, for this project, we are not only pursuing technology and manufacturing processes, but also working on battery testing and evaluation methods so that Japanese methods will become international standards." One of the most significant challenges to the practical application and upsizing of all-solid-state LIBs is production of solid electrolytes at large scale and low cost. Responding to this challenge, Professor Matsuda succeeded in preparing lithium thiophosphate (LPS) by mixing the starting material in ester organic solvent using the liquid-phase shaking method, performing centrifugation, and then reducing the pressure and drying. Previously, it was necessary to synthesize solid electrolytes by stirring a powder for a long time using a planetary ball mill. "With this method, it becomes possible to synthesize sulfide-based solid electrolytes in a short time and with less energy. In addition, the particles of the obtained solid electrolyte are extremely small "nano size" (about 50 to 100 nm), whereas those produced with a conventional planetary ball mill are about 5 μm. 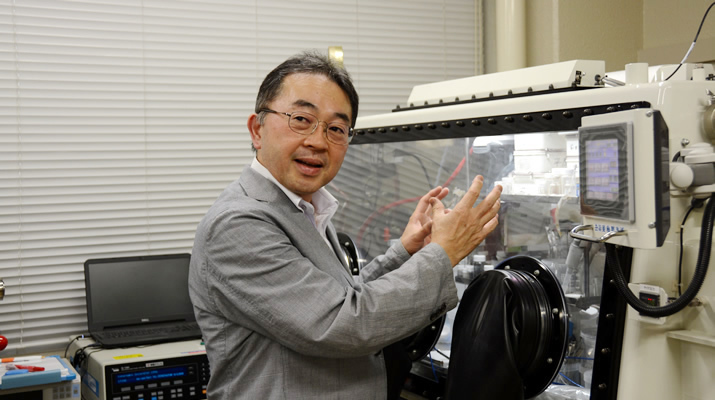 By sandwiching this electrolyte between the positive and negative electrode active materials and press molding to form a compact, it mixes moderately with the active materials of both electrodes and a good interface is obtained," says Professor Matsuda. To synthesize LPS using the conventional milling method, it is necessary to continue mixing with high energy for a long time. It is also difficult to synthesize in large quantities at once. But with the liquid-phase shaking method, LPS can be prepared in a suspended state, so it can be cheaply produced in large quantities in existing chemical plants in the future. As many countries struggle to develop sulfide-based all-solid-state LIBs, the particular reason why Professor Matsuda's manufacturing process is drawing attention is said to be its low total cost and high efficiency. Professor Matsuda summarized his outlook on the challenges ahead as follows, "Of course, many countries are seeking mass production using the liquid-phase method, but as an academic, I want to challenge myself to do everything I can. By pursuing this principle, I hope to contribute to making better quality electrolytes and safe, high-performance all-solid-state batteries." According to the market research company Fuji Keizai, mass production of all-solid-state batteries for EVs will begin in the 2020s, and by 2035 the world market will grow to 2,787.7 billion yen. Within this market, the market for sulfide-based all-solid-state batteries will account for the majority at 2,120 billion yen. This analysis backs up the government's decision to support this project on a national basis. Meanwhile, Professor Matsuda is looking even further into the future of batteries. "Metal-air batteries are one of the possibilities to come after LIBs. Compared with sulfide, they can be made of more stable materials, but at present they are difficult to manufacture, and we cannot yet see a path to their widespread use. However, it would be easy to manufacture an electrolyte that makes and moves OH- (hydroxide ions) from air if the liquid-phase method is used. In fuel cells, protons (H+) need to be moved, and the liquid-phase method also holds the key to this. I expect that I will be able to utilize my experience as a specialist in materials who has developed functional materials using liquid-phase in various ways from now on." If the performance of batteries improves, it will not only help to make EVs widespread but will also enable distributed power generation and storage, which will contribute to solving the global energy problem. We are looking forward to the further progress of Professor Matsuda's future research. 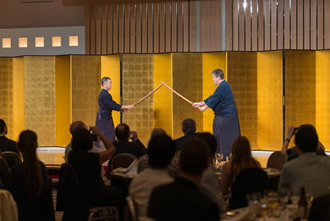 Fig.3 Prof. Matsuda (left) performed Nihon Kendo Kata with his research colleague at an international conference dinner excursion. Professor Matsuda says that he is proud of his 6th Dan level in kendo. When he was in elementary school, he watched the TV drama "Ore Wa Otoko Da!" (I am a man!) and admired Kensaku Morita who portrayed the captain of a kendo club, and so he started kendo as a club activity from junior high school. After that, he belonged to his high school and university kendo clubs, and after getting a job he was involved in the Tsukuba University friends of kendo association and the kendo club alumni group at Osaka Prefecture University, his alma mater. Currently, he serves as an advisor to the Toyohashi University of Technology kendo club. He also taught kendo to his three children. "Something you cultivate for over 40 years will not decline easily. I think it is meaningful to persevere at something. Currently, I am challenging myself to reach 7th Dan," says Professor Matsuda enthusiastically. Professor Matsuda also began synthesis of functional materials using the liquid-phase method as his graduation research when he was an undergraduate. He has worked on various themes, but by tackling problems based on liquid-phase, it has led to significant research results. This is truly "the power of perseverance." Please do your best to reach 7th Dan! 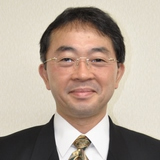 Dr. Atsunori Matsuda studied until master’s course at Osaka Prefecture University, Japan. After graduate from the university, started his career at Nippon Sheet Glass Company Ltd., and received his PhD. degree in 1992 from Osaka Prefecture University. Then, he was engaged in a research as a lecturer at Osaka Prefecture University from 1997 to 2000. Currently, he is a professor in the Department of Electrical & and Electronic Information and a vice president at Toyohashi University of Technology. His research interests are Inorganic Materials Science, Sol-Gel Method, and All-solid-state battery. Madoka Tainaka is a freelance editor, writer and interpreter. She graduated in Law from Chuo University, Japan. She served as a chief editor of "Nature Interface" magazine, a committee for the promotion of Information and Science Technology at MEXT (Ministry of Education, Culture, Sports, Science and Technology).